and where we are going in the future. World Designs, and its predecessor company World Audio Designs (WAD), came about following a decision in Spring 1993 by Noel Keywood of the magazine Hi-Fi World to publish a regular supplement alongside the magazine explaining and instructing enthusiasts in the art of making their own equipment, particularly amplifiers and speakers. The supplements proved popular, and the second issue set the ball rolling with a reworking of the classic Mullard 5-20 amplifier which was offered as a kit. 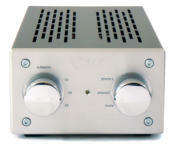 The decision proved to be an immediate success, tapping into a demand for valve amplifiers and loudspeaker kits. The vehicle providing the materials for the home enthusiast to assemble himself was World Audio Designs. New designs followed throughout the next decade, including the venerable K5881 and 300B push pull amplifiers and a number of speakers. Many of these products received wide praise. WAD drew on experienced designers, like Tim de Paravicini (EAR-Yoshino) and Andy Grove (Audio Note) with Noel Keywood and Dominic Baker (now Technical Director at Audio Partnership) from the magazine. WAD was sold in 2004 so that Noel could concentrate on the magazine. Following the sale in 2004, WAD changed hands again in 2005 when Peter Comeau bought it. Peter (later to become Director of Acoustics for IAG in China) relaunched WAD as World Designs (WD) and set about rationalising the product range while developing new amplifiers and speakers. Peter left WD in 2010 to join IAG where he is active in producing new designs for brands like Quad. WD launched the forum. When Peter left to join IAG, WD was owned briefly by Dave Cawley (Timestep and Sound Hi Fi). Dave held the fort following Peter’s departure and sold WD to Matthew Snell, the current owner, in 2011. Matthew bought WD following a chance conversation with Dave Cawley. Matthew had been aware of WAD (building a 6550 amplifier in 2005) and mentioned this to Dave who informed him that WD was now part of Dave’s portfolio. One thing leads to another, and Matthew liked the amplifiers so much he bought the company. Matthew is not only a music- lover, he has long experience in business and embraces the philosophy that good customer support is fundamental to any company. The future of WD? Some new products are planned, but the philosophy remains unchanged.